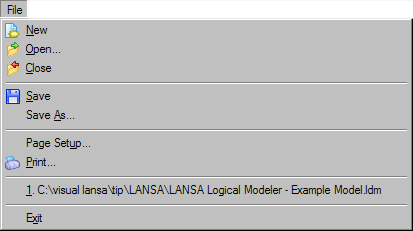 All actions available with the modeler can be executed from the menus on the modeler's main window. An option may or may not be available depending on the state of the model diagram. Note that an icon may be displayed to the left of a menu item. These icons are also available from the toolbar. The Edit menu is used to perform actions on entities, relationships and abstractions. The View menu provides options which affect the visual presentation of the diagram. Options such as Actual Size and Whole Page can be used to enlarge or reduce the size of the diagram to aid readability. 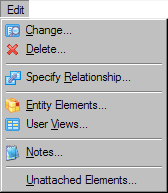 The Show Relationships options can be used to control whether relationship lines are shown on the diagram. 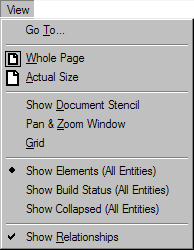 In addition, the Show Elements, Show Build Status and Show Collapsed options control the type of view of the model shown by the diagram. These views can be set for the entire model or for selected entities only.